WFP) launches school meals programme, which supports both Lebanese and Syrian children attending public primary schools across Lebanon. A carton of milk or juice, locally-baked snacks and a piece of fruit are included in a school lunch that some children in Lebanon are receiving, as part of a meals programme launched by the United Nations food relief agency. 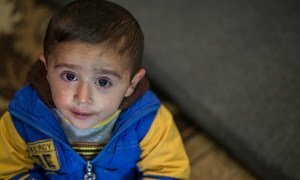 Some 10,000 vulnerable Lebanese and Syrian refugee children received the schools meals in March, the UN World Food Programme announced, allowing them energy to focus more on their studies. “By providing children with daily, nutritious meals at school, WFP can ensure improved nutritional intake for these children as well as encouraging their parents to send them to school regularly,” said WFP Lebanon Country Director Dominik Heinrich. Over the past five years, more than one million Syrian refugees have attended Lebanon’s public schools. In response, more than 250 public schools have introduced a double shirt system, to allow the enrolment of additional students. The WFP school meals programme is funded by the Italian Development Cooperation, and is being carried out in close coordination with the Ministry of Education and Higher Education and the Office of the UN High Commissioner for Refugees (UNHCR). In addition, WFP assists 600,000 Syrian refugees across Lebanon with monthly food vouchers useable at local markets.